Vacations – They Restore Our Souls | Work Well. Be Well. And of course, it was my girl–if I can still call her that after thirty-eight years of marriage. But it was also because my “girl” and I were on vacation. If we weren’t on vacation, we’d be focused on our responsibilities: at work and at home, with family and with friends. These are of course good and important things. They give our lives meaning and purpose. But, sometimes we need a break. Like everybody else we know, my wife and I try to manage our stress, but there’s only so much managing you can do. Even with the best stress management skills, our jobs and other responsibilities can wear us down. That’s why we take vacations: time to totally decompress. People decompress in different ways. Finding the ways that work best for you is an essential stress management skill. This year my wife and I took a “dream” vacation. We began most days sharing our hopes and dreams over scrumptious cups of coffee. We skied in the dream-scape vistas of the Colorado outdoors. 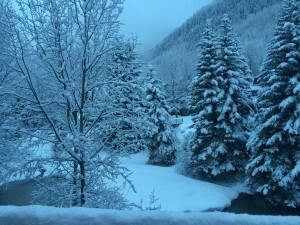 We enjoyed quiet evenings reading good books and watching the sun set over the mountains. And, we slept at least eight hours every night. More opportunities to dream! I added one other wrinkle. 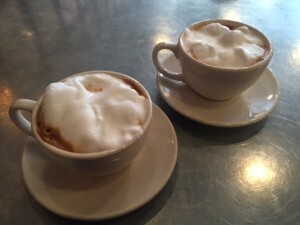 I started my vacation a couple of days early, to be on my own, to spend some time reflecting, and also do some creative writing–which for me is another way of decompressing. Here’s a poem I came up with, thanks to some vacation inspiration and a nudge from my old friend Billy Shakespeare. It’s about feeling the metaphorical sunshine when you’re refreshed and happy. And with the one you love. The warming sun. The morning’s gentle breeze. The birds a-singing. The children at play. A stroll through the garden: lush flowers, tall trees. When I’m back in Houston, stressing out because I forgot to bring my ID badge to work, or because the faucet broke or the possums ate my tomatoes, I’ll read this poem and meditate on these photos. They’ll help me recover that feeling of relaxation and romance that only vacations can give. 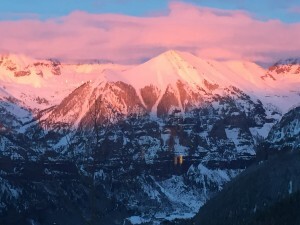 If you visit Telluride and take the gondola in the evening, you’ll get this view of Ajax Mountain as the sun sets behind you. 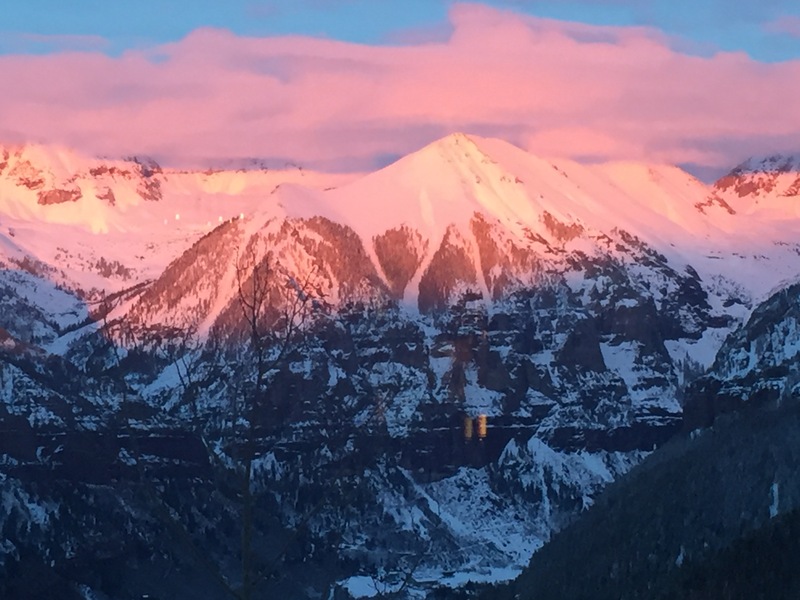 They call it the “alpenglow.” And if you like relaxing over a cup of coffee, you’ll love Ghost Town Grocer, also in Telluride.